The Labo 5 Forum high speed productivity door has a self supporting frame made of multi composite material that provides advantages over traditional stainless steel door frames in pharmaceutical and clean room environments. The composite material is fully washable and will never rust or need painting. Average raise/lower speed of 48" per second means quick passage times for maximum control of air quality and environmental issues. 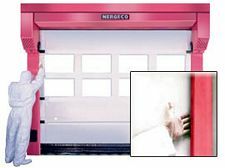 Installing a high-speed door helps ensure cleanliness, superior sealing and reliability in laboratory, pharmaceutical, and other clean room applications. 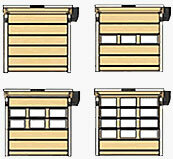 Features Nergeco’s patented reinsertion guides. 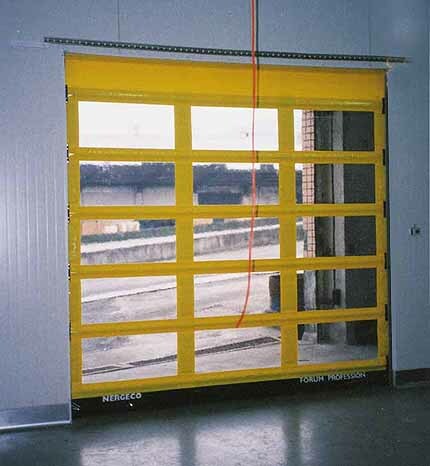 If accidental impact should occur, the door will reinsert itself without operator intervention.